Honor her for her gifts of laughter, warmth and hope. Honor Mary Tyler Moore with Us For her gifts of laughter, warmth, and hope. She filled our homes with smiles, laughter, and most of all — hope! But it was her real-life role as a champion for the type 1 diabetes (T1D) community that will be her most enduring legacy. 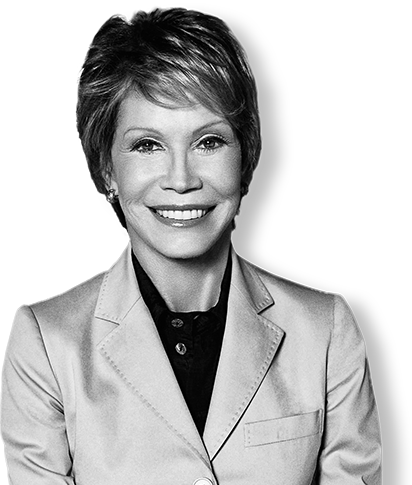 As the international chairman of JDRF since 1984, Mary Tyler Moore testified in front of Congress and led public service campaigns that helped raise billions of dollars for research to remove the impact of T1D from people’s lives until we finally achieve a world without T1D. Join us in celebrating Mary Tyler Moore’s magnificent life by leaving your tribute to everything she is, was, and always will be. Let's win Mary's fight, together! You can also honor Mary's life and passion for JDRF by making a gift today. Choose a photo of Mary to display with your tribute.